Editor's Note: Kaicho Nakamura still speaks with somewhat of a Japanese accent. His use of words and sentence structure in this lecture have been retained as much as possible to give a better sense of his person and flavor of his speech. I have a few things today that I would like to mention. Sometimes way people starting karate, they are just only concerned with their technique, how they kick or punch, or their forms. But more than that, the way you study is not just your kata, your fighting form, or fighting spirit but how you study karate applied to daily life. And we always say, the way we study in not only karate, but karate-do. So lots of moral, lots of discipline is required to call yourself karate-ka. So each of you here I think -- continue good moral, good discipline --moment to moment. This is one of my favorite expressions. I want you to remember these words today -- especially discipline and flexibility. Together they mean Setsu do Motsu. In training, certain times come when you must tighten yourself. (Here, Kaicho Nakamura holds his hands in front of his body as if holding a sword. He twists his hands inward as if tightening something.) Discipline. 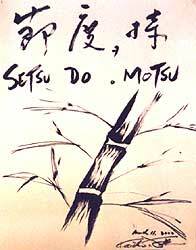 This is Setsu do Motsu. You must always carry discipline. (Then he points to the lowest segment of the bamboo stalk.) Certain times come when you must tighten yourself. Then another time comes when again you must tighten yourself (pointing to the bamboo segment above the first one). This is the way we grow. Each segment is stiff, has strength, discipline. 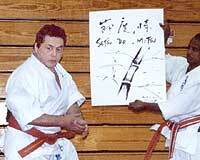 (Kaicho Nakamura then picks up two practice sword. First he shows a solid wood sword.) What I have here is a bokken, kind of hard. (Then taking the solid wooden sword, he smacks it hard on the floor.) "WHACK." (He then picks up a practice kendo sword made of strips of tied bamboo.) This Shinai is made of bamboo and is hollow inside, but when it hits the floor, "WHACK," it is flexible and doesn't break. Still it is serious sword. When we fight against solid wood practice swords, sometimes they break, but with a shinai we can hit hard and it doesn't break. So I want you to understand bamboo -- it has flexibility. When growing bamboo must have this (he points to each distinct segment of bamboo along its trunk) in order to grow. Without it (the segments) it would fall down without strength. In the winter time when I was a kid I used to go with my family to part of Japan (northern island) where there was lots of snow, an area that also had lots of bamboo. There was lots and lots of snow, and as the bamboo became covered with snow, down, down, down it would bend almost to the ground. (Nakamura here uses one of the wooden swords to illustrate it bending over under the weight of the snow.) There were also some sorts of trees and when lots of snow came, even big branches would break. But bamboo in winter time and snow bends, goes down almost to the ground. Then winter changes, snow starts to melt. A little bamboo comes up, comes up and comes up (here still using a wooden sword, he holds it straight up again) and 'aaahhh.' Then chance more to grow. This always remind me of Setsu do Motsu. Without discipline we can go down and stop (ending up there). So remember as Karate-ka, always have flexibility, but also strength in discipline. This is easy when in the dojo, when in front of the teachers or senpais, easy when you have your belt on and can say 'I'm Karate-ka, I have good form, I am fighting, I work hard.' But after you get changed, wherever you go -- sometimes you forget. It's all attitude -- be careful. Wherever you go you are karate-ka, you are your dojo. Carry on as if your dojo exists wherever you go, especially when you are alone and no one watching. So please continue to be proud with what you are doing. Your karate is not just karate discipline, skill, technique, your fighting or knowing many kata. Most important IS TO BECOME A BETTER PERSON! Even children should say, 'Since I started karate, I enjoy more my study, listen more my parents and more concentrate. Since I study karate, I more a chance to understand myself, more listen to other people and more appreciate -- yourself and what you have. Then you become a good karate-ka. Note: This lecture, was given in March 2000, to students of Seido Karate at the Cornell College Champion Festival/ Tournament in Ithaca, New York. Nakamura regularly lectures on aspects of karate-do during weekly mediation sessions held at Seido Karate's New York City Headquarters. A number of these lectures are published in his book, One Day, One Lifetime -- An Illustrated Guide to the Spirit, Practice and Philosophy of Seido Karate Meditation. Kaicho Tadashi Nakamura, 9th dan, is the founder (1976) and Chairman of the World Seido Karate Organization ("Seido" meaning Sincere Way) and established the Seido Juku headquarters in New York City. It has grown into one of the largest and most respected dojos in the city and the Seido system has spread accross the US and to more than 20 countires worldwide. He is the author of many books on karate including "Karate, Technique and Spirit", "The Human Face of Karate," and "One Day, One Lifetime, An Illustrated Guide to the Spirit, Practice and Philosophy of Seido Karate Meditation." Nakamura's karate is noted for its focus on teaching of the mental and spiritual aspects of karate and for his belief that karate should benefit everyone, not just the young and the strong.